Office boy. 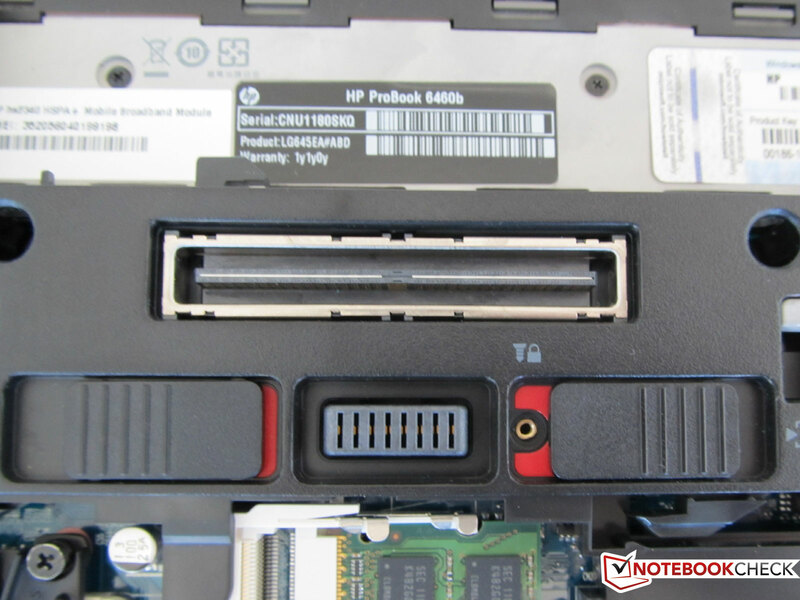 The HP ProBook 6460b LG645EA integrates itself seamlessly into the 2011 range, whose representatives we were allowed to review over the past weeks. This notebook is equipped with a Core i5 CPU and a 14 inch screen that can display a clearly arranged resolution of 1600x900 pixels. If we were to line up all laptops of the ProBook range next to each other, the devices would hardly differ in looks. Merely the dimension would vary due to the respective screen size. 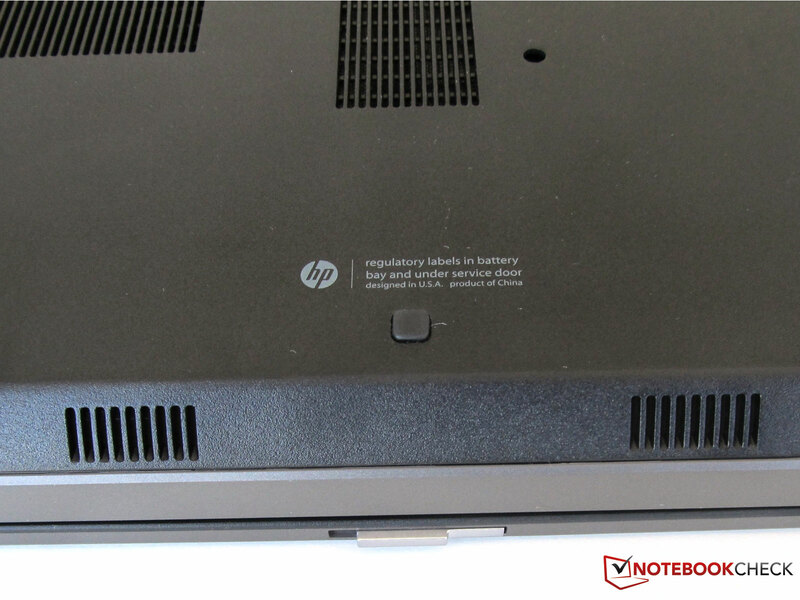 All notebooks that we were allowed to review over the past few weeks, such as the ProBook 6560b or the Elitebook 8460p, show a new case design that HP had presented for all 2011 business notebook models at a press conference at the end of March. This high-end design, with matt brushed aluminum, is also used for the present 6460b from the manufacturer, HP. 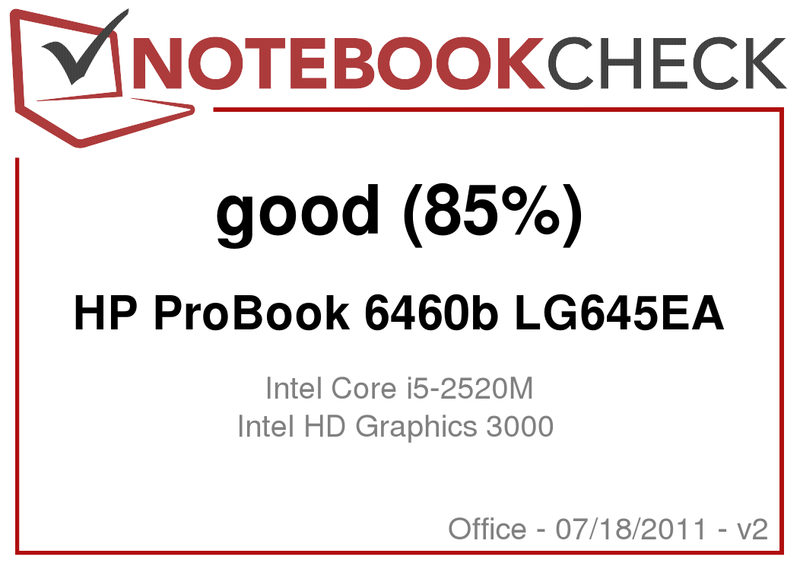 A Core i5-2530M of the second processor generation does its job in the HP ProBook 6460b LG645EA. The dual core CPU has a base clock of 2.5 GHz and a 3 MB L3 cache. The CPU is also responsible for the graphics (HD Graphics 3000) because a dedicated graphics card isn't installed into this model. 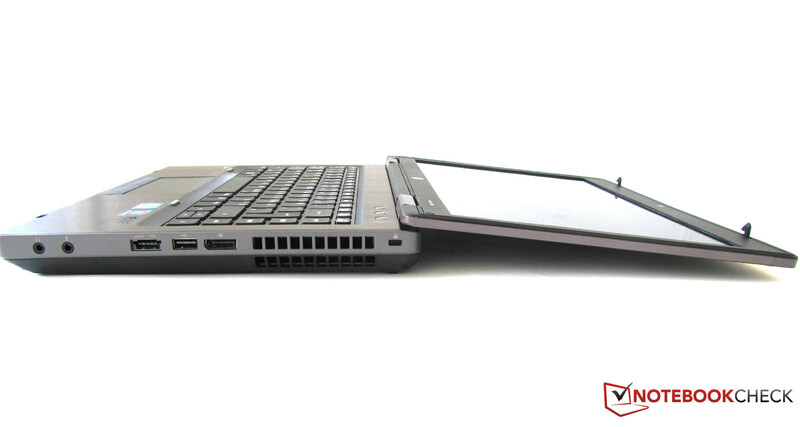 Moreover, the HP ProBook is equipped with a 500 GB sized hard disk, a 4 GB RAM and a 14 inch HD+ screen. 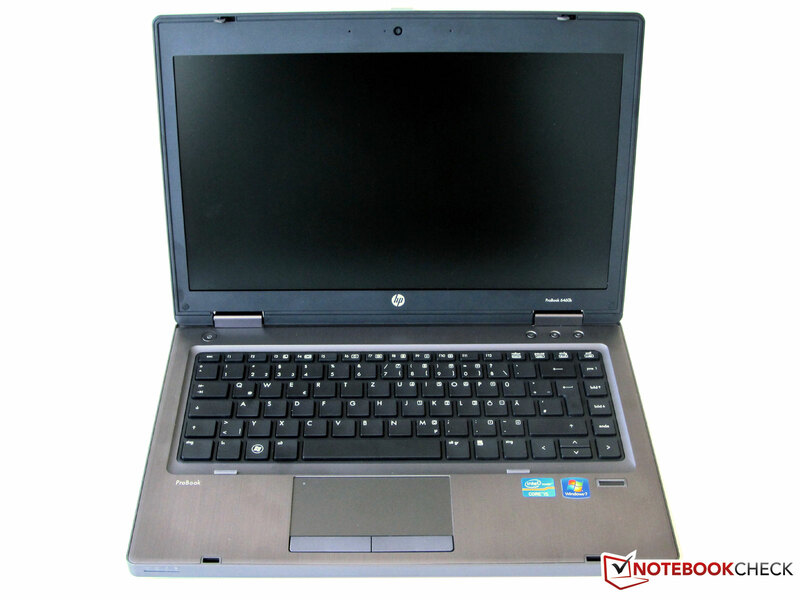 The HP ProBook 6460b LG645EA is price tagged at about 880 euros in this configuration. 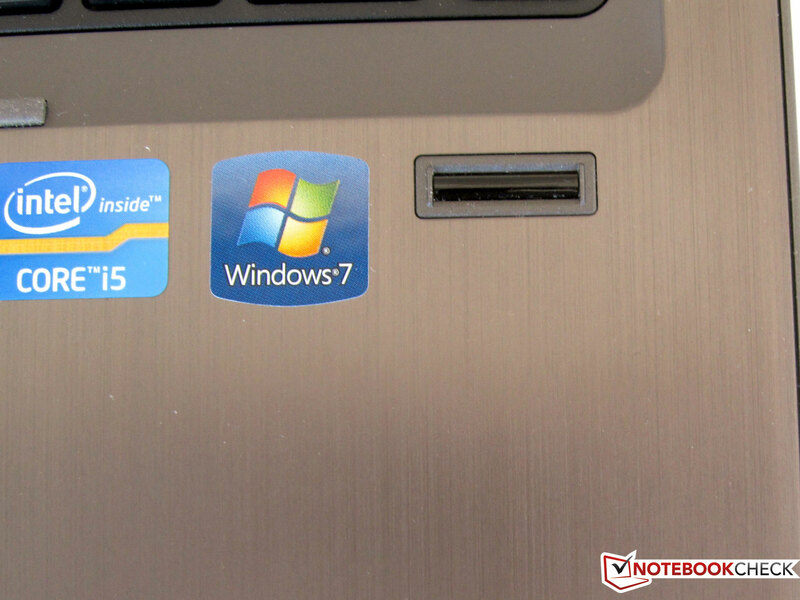 The ProBook 6460b LG645EA's case is, alike the ProBook range's family members, very successful in terms of looks. 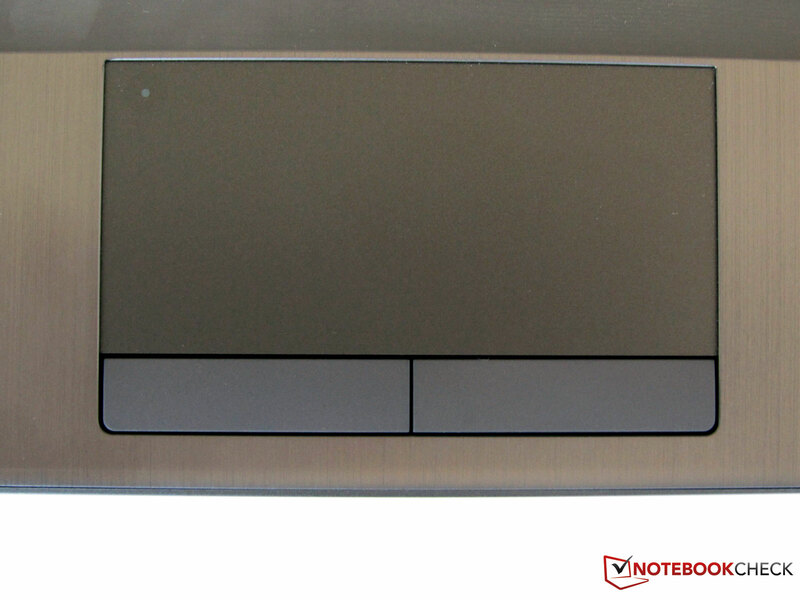 HP also relies on the 2011 design with matt, brushed aluminum in a titanium colored outfit for the ProBook 6460b LG645EA. The case's workmanship and stability gives no reason for complaint. This model's chassis has also been reinforced with magnesium. 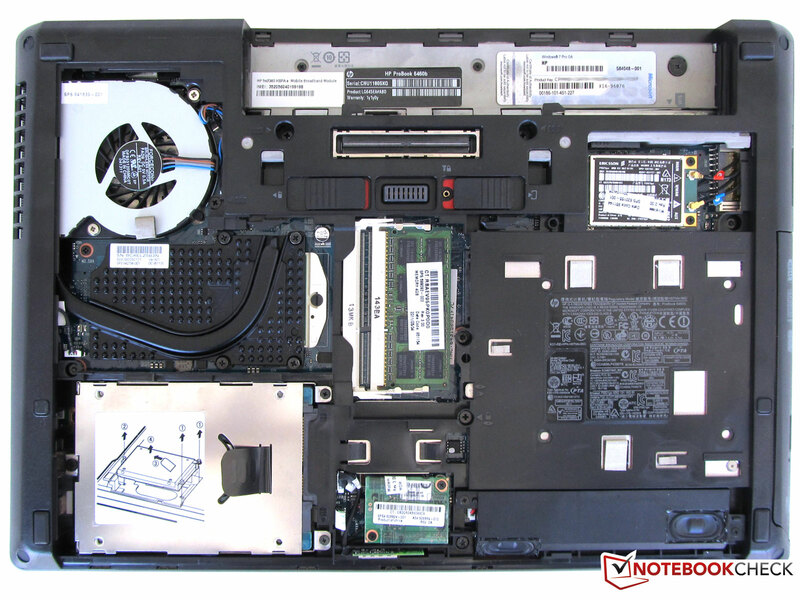 In this case, the used materials don't have an adverse effect on the ProBook 6460b LG645EA's weight. This notebook even belongs to one of the lighter ones in the 14 inch laptop weight category with 2090 grams (apart from the Slim Line notebooks, that is). The HP laptop proves to be quite handy and thus can be stored well in your hand luggage with its dimensions of 338x34x231 mm. The robust aluminum case is very resistant against vibrations and other environmental influences. Merely the case's platinum surface doesn't like to be touched and is therefore quickly covered with unwelcome fingerprints. Alike the previous models, the case's lid can be opened with only one hand. 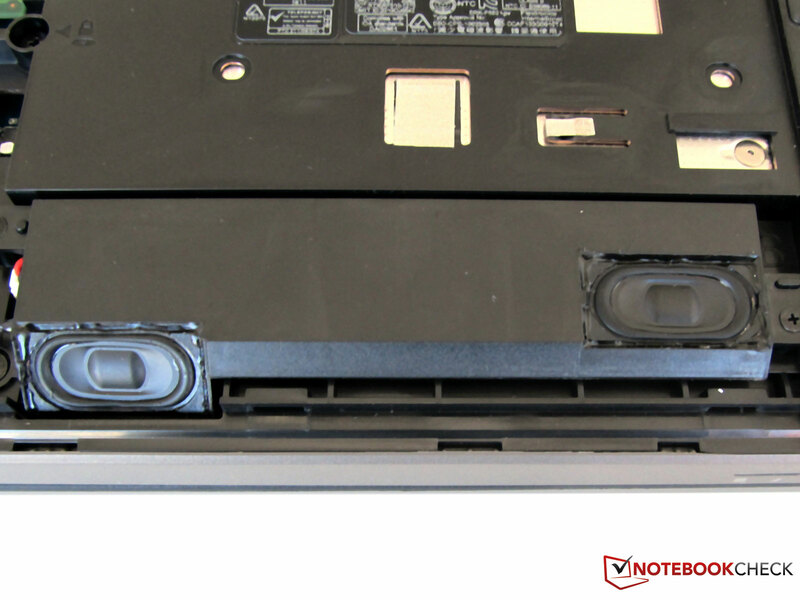 The HP ProBook's new hinges still make opening difficult in the beginning. However, the notebook doesn't topple over backwards when opened to the maximum. Two firmly catching transportation hooks on the left and right keep the laptop's case lid fastened to the base unit in a closed state. 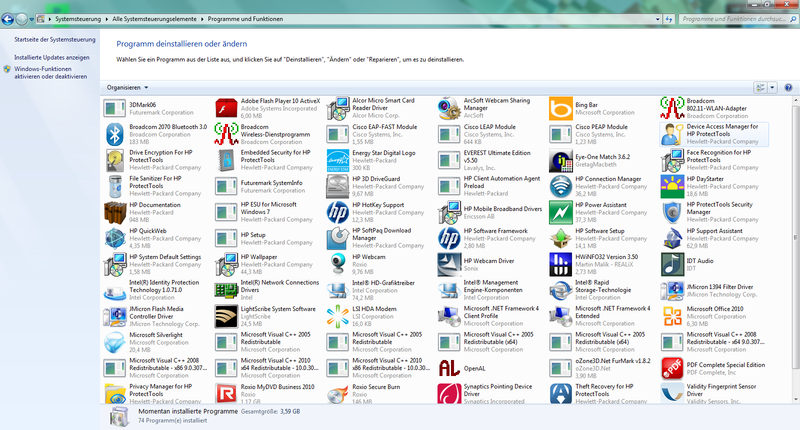 There are many various interfaces found on the HP ProBook 6460b. 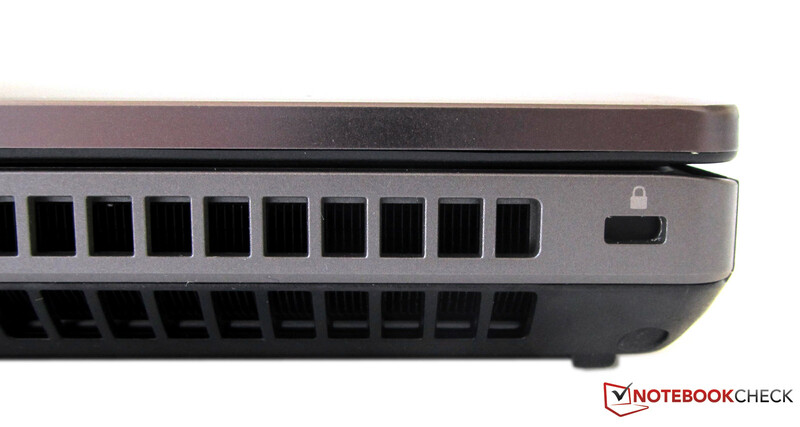 Due to the compact size, HP had to distribute the ports over three sides of the ProBook 6460b LG645EA. There are only a few LEDs, but no interfaces are to be seen on the front. Located on the left: Two USB 2.0 ports, an IEEE1394 socket (FireWire), a DVD burner and an ExpressCard 54mm slot. The card reader for flash memory cards is additionally installed beneath both USB ports. 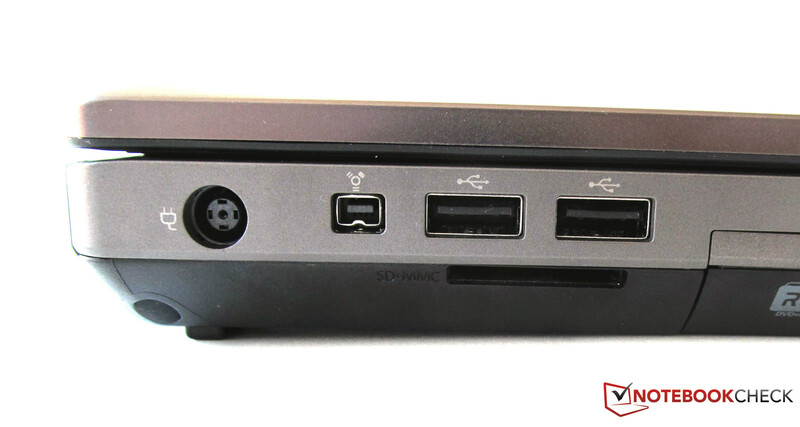 On the device's right: an audio in and out, an eSATA/USB combo port, a USB 2.0 port and a display port socket. 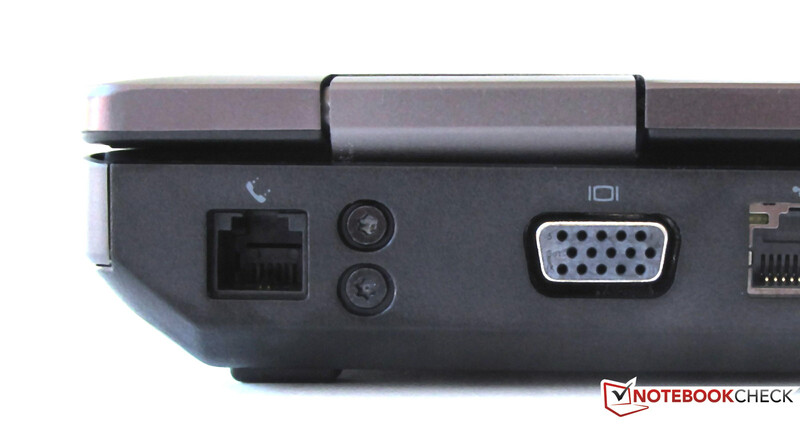 The interfaces for modem, VGA monitor and cable networking are found when looking at the HP ProBook's rear. The space between the single ports is generous so that all connections can be occupied at the same time. Even two larger USB sticks hardly get into each other's way. Since the interfaces are distributed over three sides you have many cables or "docked" peripherals around the notebook during extensive use. 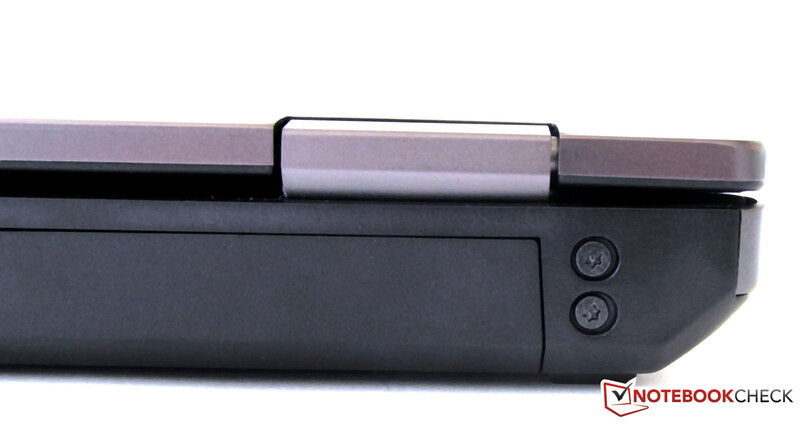 For this case, there is a connection for an optionally available docking station on the device's bottom. Depending on the model, it costs about 220 euros and bids 4 additional USB ports, a Display port, a DVI and VGA out. You have several options for connecting to the company network or the Internet right away with the HP ProBook. First, the cabled option via the 10/100/1000 compatible LAN socket on the rear. Another possibility is via the integrated wireless LAN standard IEEE 802.11 b/g/n. 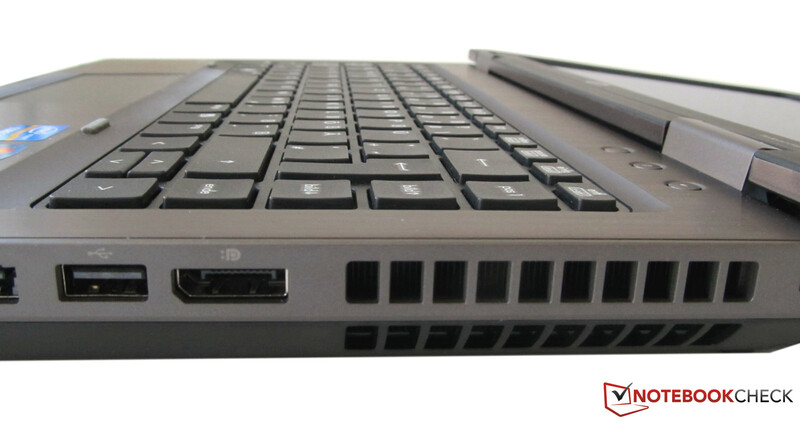 Moreover, our ProBook alternative has Bluetooth, a 56k modem and a 3G compatible WWAN module. The ProBook is equipped with many security functions. Among them, a fingerprint reader and the security lock slot (Kensington lock), a TPM Embedded Security Chip 1.2, Enhanced Pre-Boot Security and a disk encryption. The security tool, HP Spare Key, isn't pre-installed on the laptop, but can be installed subsequently if the user requires it. 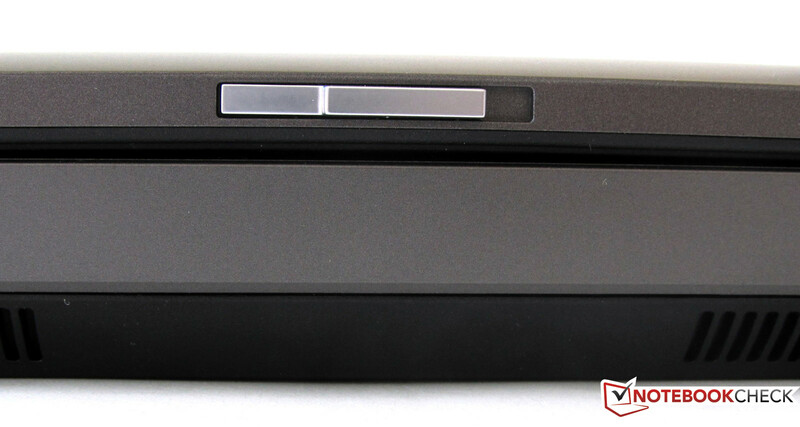 HP optionally offers Computrace Pro and a smart card reader. 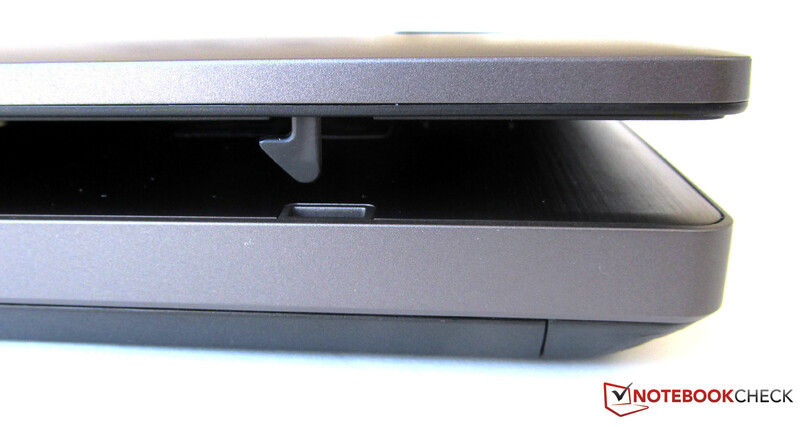 The latter is built into the ExpressCard slot. HP restricts itself to the most necessary in terms of included supplies - as in almost all of its notebooks. Print is only found in the way of a few leaflets and notes. 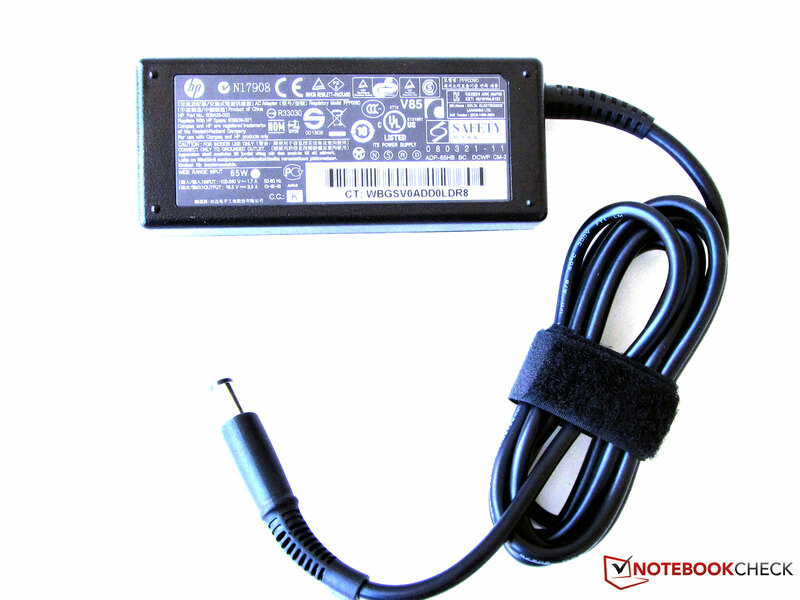 Besides the various CD media, the 65 watt power adapter for the notebook is included. Windows 7 Professional 64 bit version is used as the operating system. It can be found in the form of image files on a recovery partition. There is also more software installed in the state of delivery. For example, a reduced functionality version of Microsoft Office 2010. Norton Internet Security 2011 is also installed. However, you need a license after 60 days of use. HP has installed Roxio Secure Burn as burner software. The warranty period is 12 months. It can be extended with an optionally available and fee-based onsite service and a warranty extension. An extension of up to 5 years including onsite service is possible with the HP Care Pack. The QWERTZ keyboard is spill proof, like in its bigger brother, the ProBook 6560b. Should it come in touch with water, it can be drained off again. The single keys stand alone and are easy to use. Typing during the test phase was very pleasant and there weren't any unpleasant typing noises. The J and F keys have a small bump to locate them better and can be found without looking. This HP ProBook doesn't have a separate number pad. 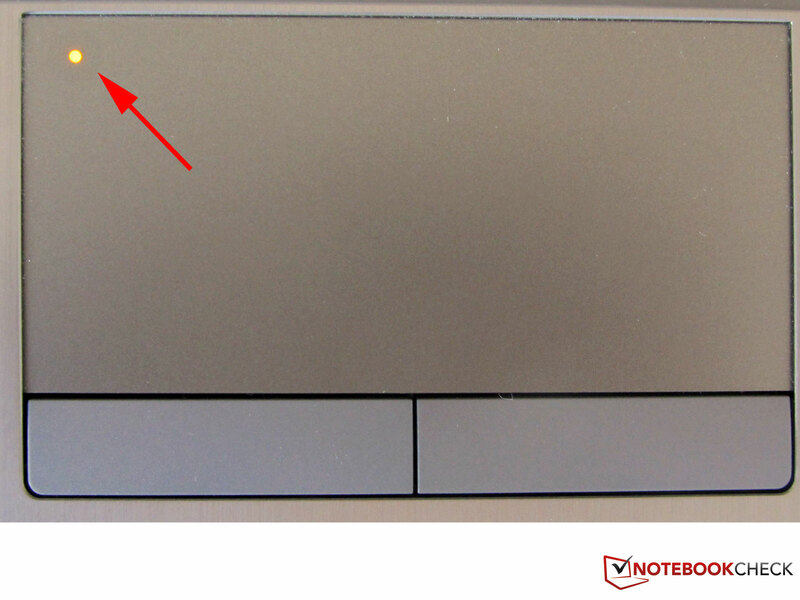 The four arrow keys are very small in the ProBook 6460b and are on the same height as the other keys. HP only uses the most necessary keys in the layout. WLAN can be turned on and off, the web browser can be opened or sound can be muted via three shortcut keys. There is a fairly big touchpad in front of the keyboard. It supports multi-touch inputs and gesture control. It also has an area that can be used for 2-way scrolling. The touchpad's surface gliding capabilities are very good. There are two keys in front of the touchpad which take care of the mouse key functions. 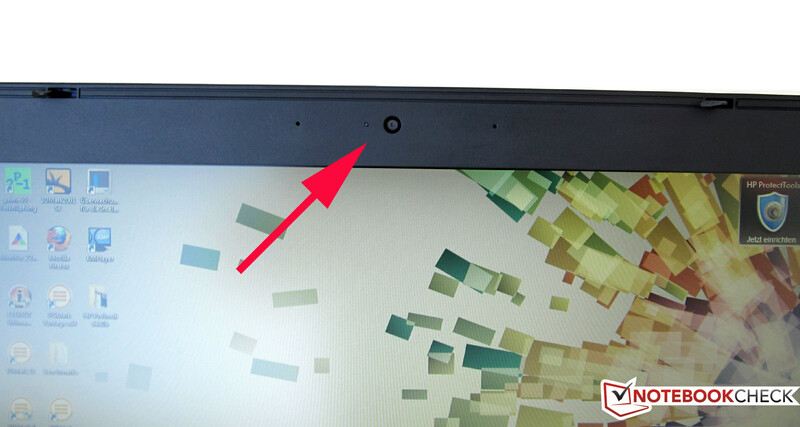 There is a small dot, almost invisible, in the touchpad over which the touchpad can be disabled and enabled. The touchpad is turned off when it's tapped twice by a finger and a LED indicates that it's disabled. A sensible option for prolific typists who don't always want to follow the cursor on the screen. The HP ProBook 6460b LG645EA is equipped with a 14 inch anti-glare LED screen. 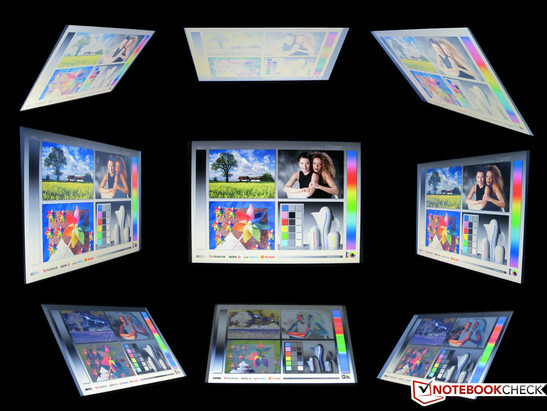 It can display HD+ resolution of 1600x900 pixels in a 16:9 format. The screen hardly throws any reflections back at you as is appropriate for a business laptop. The incorporated HD Graphics 3000 has to suffice for video output in this model. The Intel graphics doesn't have a dedicated video memory and uses a part from the installed RAM. More monitors can be connected via the Display port and the VGA socket. Thus, a multi-display workplace can be created in the office. The built-in display isn't necessarily the perfect solution for daily office work with its 14 inches. Script on the screen looks quite small. The resolution can be reduced to 800x600 from 1366x768 pixels, but the quality suffers. Also for this reason, it's recommendable to use an external monitor during stationary use. Nevertheless, you have all advantages with the HD+ resolution on the go, for example when working with several windows at the same time. The assessed black value is a high 1.87 cd/m2, with a contrast ratio of only 128:1. The screen distributes the brightness very evenly (91%). The average rate was 234.3 cd/m2 here. The HD+ screen's color spectrum is narrow. AdobeRGB (t) is clearly failed. The comparisons with sRGB (t) or Apple's RGB (t) aren't quite as different, though they clearly remain unreached. However, this will only deter professional picture editors and graphic designers. The HD+ anti-glare in the ProBook also has to struggle with lighting conditions outdoors. The color's brilliance quickly deteriorates in direct sunlight. The colors bleach and the displayed content becomes almost illegible. It's slightly better in the shade. At least, you can see quite a bit in the (beer) garden. However, the more sun, the less you'll recognize. The screen would have to be greatly improved in both brightness and contrast for a full outdoor suitability. The HP ProBook 6460b LG645EA's viewing angles are quite modest. While the colors are still very vivid in an ideal viewing angle, the slightest deviation let them loose on brilliance. While the lateral viewing angles still appear to be acceptable at a 45 degree angle, additional tilting either way is a deal breaker for the HD+ display. The picture was still well visible from both directions in our mandatory viewing angle test of 45 degrees. An inverted, respectively faded picture was displayed when an additional tilt of +45, respectively +45 degrees was added in every setting. 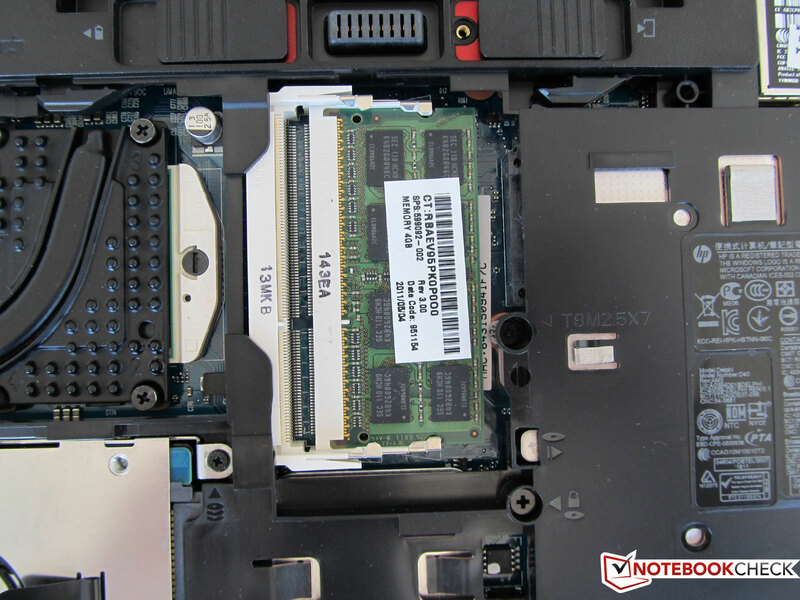 An Intel Core i5-2520M does its job inside the HP ProBook 6480b LG645EA. This second generation Core i5 has Hyper Threading support, whereby the number of computing cores is doubled from 2 to 4 cores. Single CPU cores can occasionally be automatically overclocked up to 3.2 GHz by the Turbo Boost technology. The processor has a 3 MB sized level 3 cache and is manufactured in a 32 nm technology. In addition to the processing unit, Intel has also installed a DirectX 10 capable Intel HD Graphics 3000 Graphics and the memory controller in the Sandy Bridge dual core processor. The maximum clock rate of 3.2 GHz was only used up to a die temperature of about 80 degrees Celsius in the stress test. After that the Turbo mode was no longer exhausted and the CPU "only" ran with the base clock of 2.5 GHz. The CPU's clock stayed constant with at least 2.5 GHz in our simulated stress test of several hours, where two computing intensive programs ran simultaneously (CPU and GPU 100% load). Thus, we didn't observe an impending throttling. This laptop was no exception and had to run through many tests in the benchmark marathon. In addition to cross-component test tools, such as PCMark 05, PCMark 7 and PCMark Vantage, which assess the entire bundle (CPU, GPU, memory and hard disk), the hard disk's speed was also tested. Furthermore, the laptop had to endure a few synthetic benchmarks from Futuremark. These test tools specify just how fast the laptop's graphic functions are. 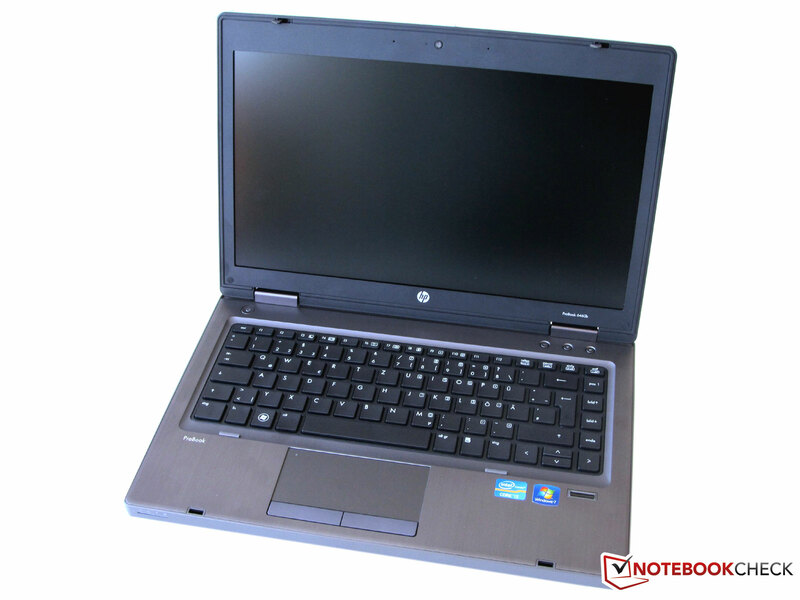 The graphics function only has a secondary role in a business laptop, such as the HP ProBook 6460b LG645EA. However, it shouldn't be underestimated because more and more programs use the resources of a graphics card to accelerate processes and to unburden the CPU (video and audio de / compression, etc.) But you still are sufficiently equipped with an incorporated graphics solution for conventional office use (Internet, Word, Excel, etc.). The incorporated HD Graphics 3000 video performance is significantly better than in the old Intel HD Graphics and is equal to an entry level graphics card (for example, Nvidia GeForce 310M). The Intel HD graphics is also clocked from 650 MHz to 1200 MHz dynamically thanks to Turbo Boost. 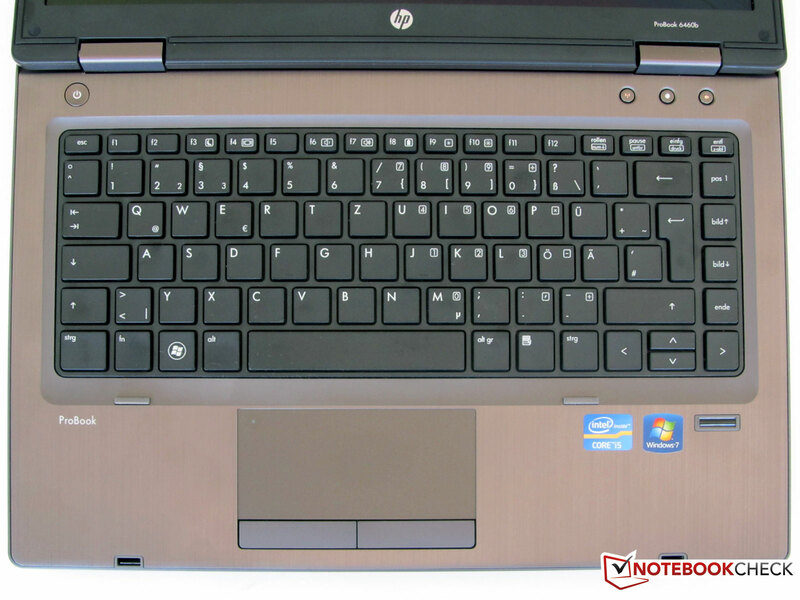 Comparing the benchmark programs' results, the HP notebook proves to be quite reliable and is on a par with the opponents in this notebook category. The device reaches a score of 7703 points in PCMark Vantage and is thus only 31 points behind its 14 inch brother the EliteBook 8460p from HP, where a stronger Core i7 2620M and a Radeon HD6470M graphics solution are used. The latest test device achieved a score of 2315 in the newest benchmark tool, PCMark 7. The HP EliteBook 8460p even only reached a score of 1994 points here. The Intel HD Graphics 3000's graphics and 3D performance are on the expected level (see: benchmark list and comparison of notebook graphic cards). The 3DMark 11 benchmark didn't run due to compatibility problems with DirectX 11 (HD Graphics 3000). 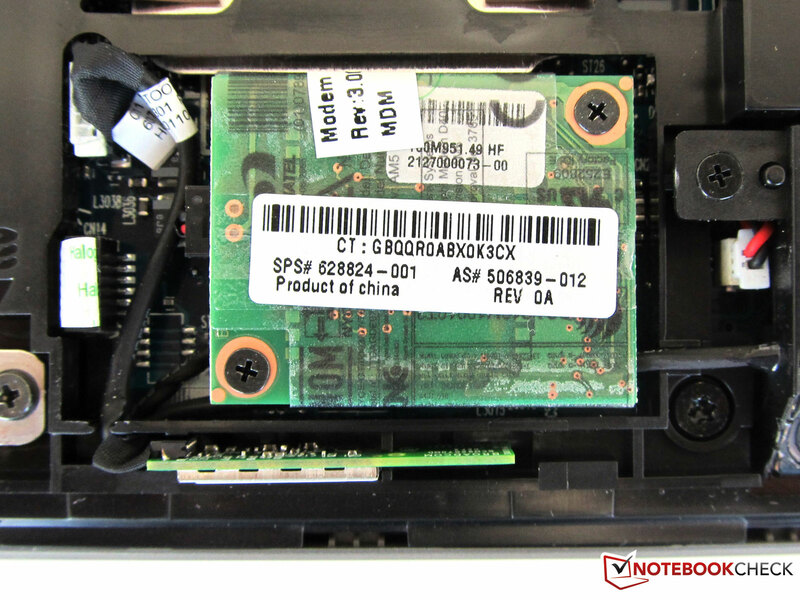 A Seagate disk is used as the hard disk in the HP ProBook. The ST9500420AS, with a (gross) memory capacity of 500 GB, rotates with fast 7200 revolutions per minute. The average transfer rate, measured with HDTune, was 78.63 MB/s in the test. We could tickle out more of the disk with CrystalDiskMark 3.0. CrystalDiskMark 3.0 determined a smooth rate of 98 MB/s, whereby we ran it five times. The burst rate was 104.3 MB/s at a CPU capacity of 3.9 percent in the test. A 7200 rpm notebook hard disk should actually be capable of a bit more. The processor's incorporated HD graphics is more than sufficient for office applications, Internet surfing or flash games. But even not quite as graphics-heavy games can be played well when the resolution and detail level is set accordingly. High-end games, which push the graphics to its limits, shouldn't be played on this business laptop. We briefly tested which games run on this incorporated HD graphics with a few up to date games. These and more results can be read in our comprehensive database "Computer Games on Laptop Graphics Cards". 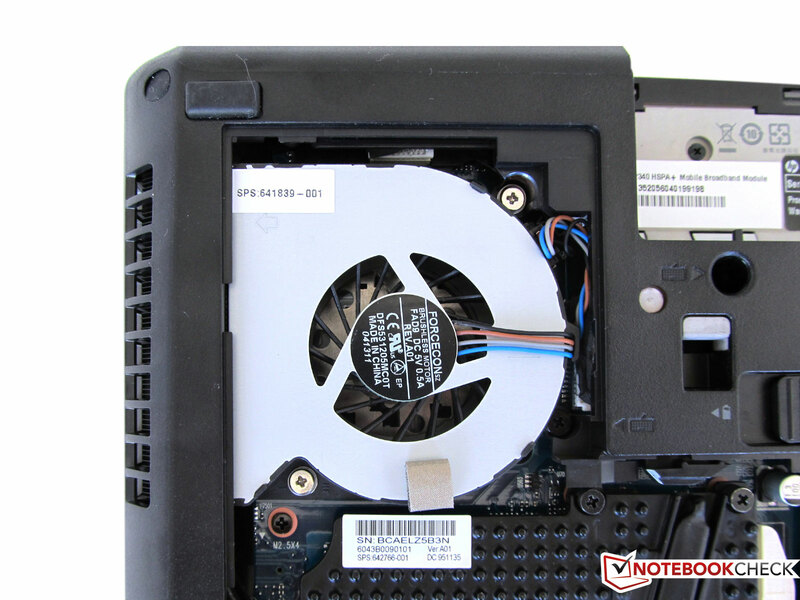 The ventilation system, which consists of a strong system fan and a dissipating heatpipe construction, sometimes has a hard job to discharge the power loss effectively out of the case - depending on the Intel dual core CPU's load. The fan was hardly or quietly audible in idle mode. The noise level was between 32.8 dB (A) and 35.7 dB (A). This rate is hardly noticed in an office environment because the surroundings are usually a lot louder. The fan got a bit louder during DVD playing. We could measure 33 dB (A) here. The usually "fairly quiet" fan turned into a summer breeze and reached a maximum level of 41.8 dB (A) in the simulated stress test. Thus, although the fan is fairly quiet in routine work, the noise increases significantly during load. The fan noise is drowned out quickly in a room. The fan was perceived as a lot quieter at a distance of 2 meters. Moreover, load increase or decrease, like simulated in our stress test, shouldn't occur in practical use anyway. Not only did the fan get louder as time passed, the case also got noticeably warmer. The HP ProBook's surface remained cool as expected in idle. We could measure temperatures between 25.4 and 28.8 degrees Celsius in an ambient temperature of 22.6 degrees. There were areas on the bottom that exceeded 34 degrees Celsius. The temperatures increased quite a bit during load. We could measure the maximum rate of 34.6 degrees Celsius in the upper right, where the cooling system's air vents are located. This was also confirmed by the temperature assessment on the bottom. The measured rates were around 39.7 degrees Celsius in the "exhaust's" area. In comparison: Only 30.6 degrees were measured here in idle mode. The rest of the case stays within a pleasant range with an average temperature of 30, respectively 32 degrees Celsius even during load. We averaged the top's and bottom's temperature for this. Various programs were started at the same time for the simulated stress test. First, Prime95 to fire up the CPU and second Furmark for the graphics. In addition to CPU-Z and GPU-Z, we also used the program Everest Ultimate from Lavalys for monitoring. We could follow the CPU's increasing temperatures. It gets very warm in these extreme conditions with up to 86°C (Everest estimate), but nevertheless remains significantly under its allowed maximum. The power adapter also had more work in the stress test and got a lot warmer. The measuring rates reached a maximum of 51.1 degrees Celsius in contrast to 34.1 degrees Celsius in idle mode. (-) The average temperature of the palmrest area of similar devices was 28.2 °C / 82.8 F (-2.2 °C / -3.9 F). Two built-in stereo speakers are available for the sound emission, which the manufacturer labels with "SRS Premium Sound". Both speakers are located on the front, below the keyboard. One of the two speakers is in the center, the other on the outer side. The sound and surround feel is satisfactory for system sounds or music in a quiet range during normal use. However, when the volume is turned up, the tiny speakers start to clink. The expectations placed on HP's SRS Premium Sound rendering leaves a lot to be hoped for because both speakers have almost no bass. 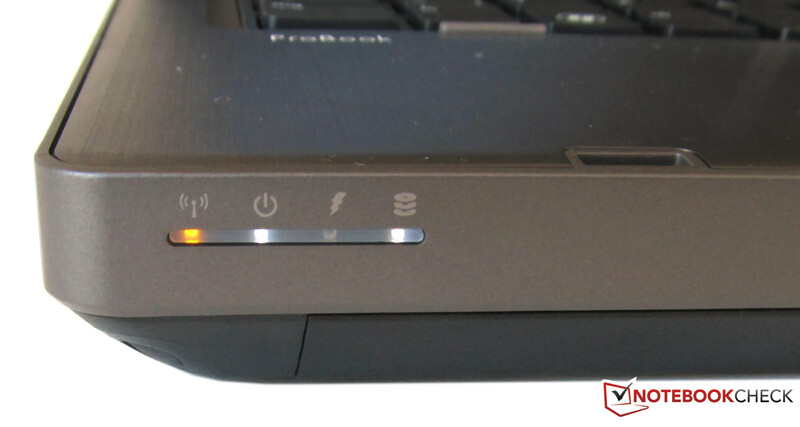 The HP ProBook LG645EA's standby power consumption is 0.4 watts. Up to 14.1 watts are pulled out of the outlet in idle mode with maximum brightness, high performance profile and enabled WLAN. The maximum power consumption is 56.2 watts in this model. The display's brightness is set to maximum, the high performance profile was selected and WLAN was enabled for this. Additionally, the programs, Furmark and Prime 95 were also started. The HP ProBook's compact 65 watt power adapter is more than sufficiently sized for this. 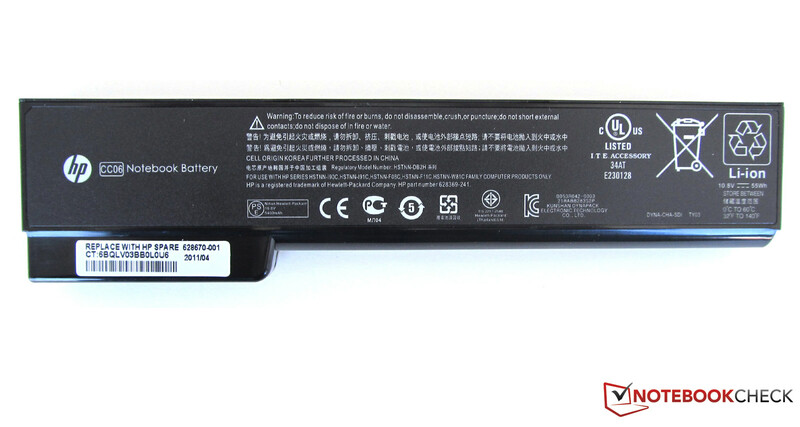 The HP ProBook 6460b LG645EA is equipped with a 6 cell lithium ion battery. We drained the battery by means of various scenarios and recharged it again in order to measure the battery runtimes. The program BatteryEater Pro records the time needed for discharging/charging the battery. 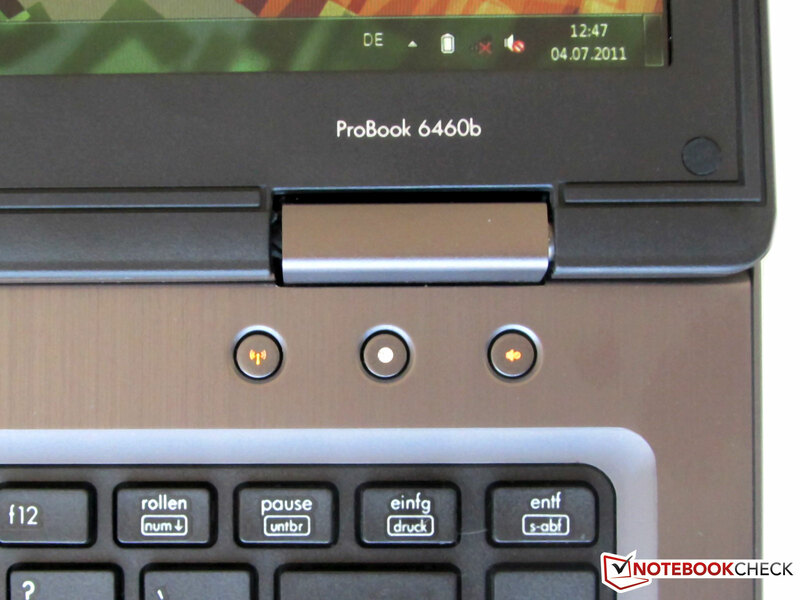 The ProBook 6460b LG645EA achieved a battery life of 1 hour and 15 minutes in the first round with the Classic test (load, maximum brightness and enabled WLAN, high performance profile). The battery reached a runtime of 416 minutes in the Reader's test (idle mode, maximum energy saving options, no WLAN and minimum display brightness). That is equivalent to almost 7 hours of maximum possible battery life. We measured 3 hours and 35 minutes of surfing via the integrated WLAN on the go. We set the display to a good brightness here. A movie night was simulated without WLAN, but with full display brightness. 3 hours weren't quite reached, but 2 hours and 49 minutes anyhow. Alike the HP ProBook 6560b-LG658EA, the HP battery needs 112 minutes to completely recharge. 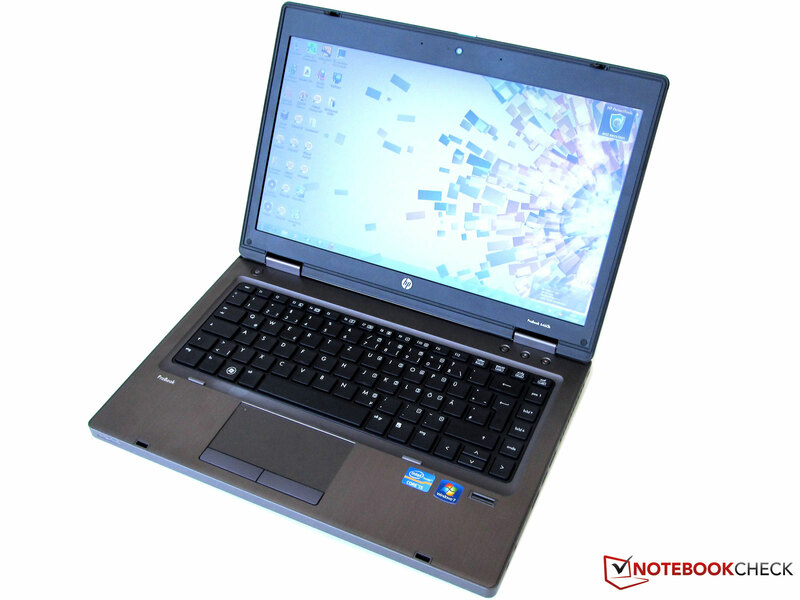 The ProBook 6460b LG645EA is another office notebook from HP that convinces in almost every way. The aluminum case, which has been additionally reinforced with magnesium isn't only robust but is also a good looker. 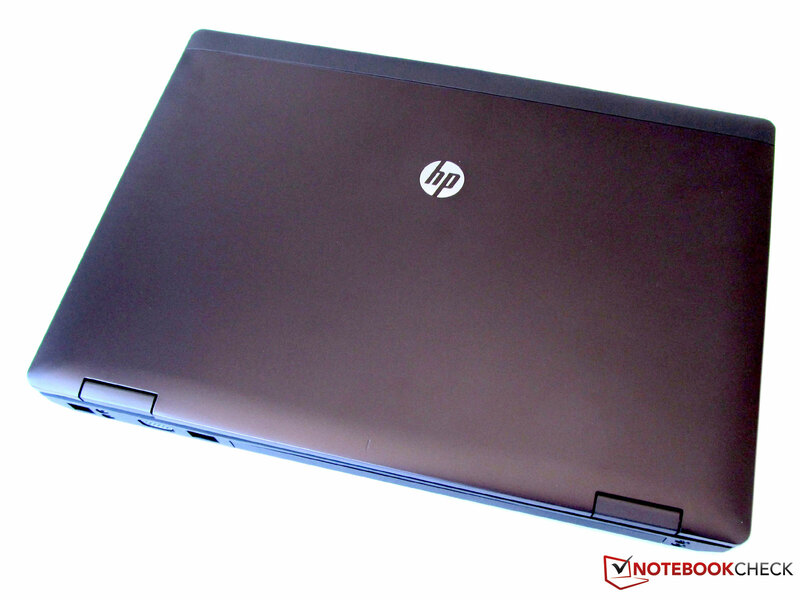 Alike the other 2011 models from this HP range, this notebook is very stable and can endure a lot. 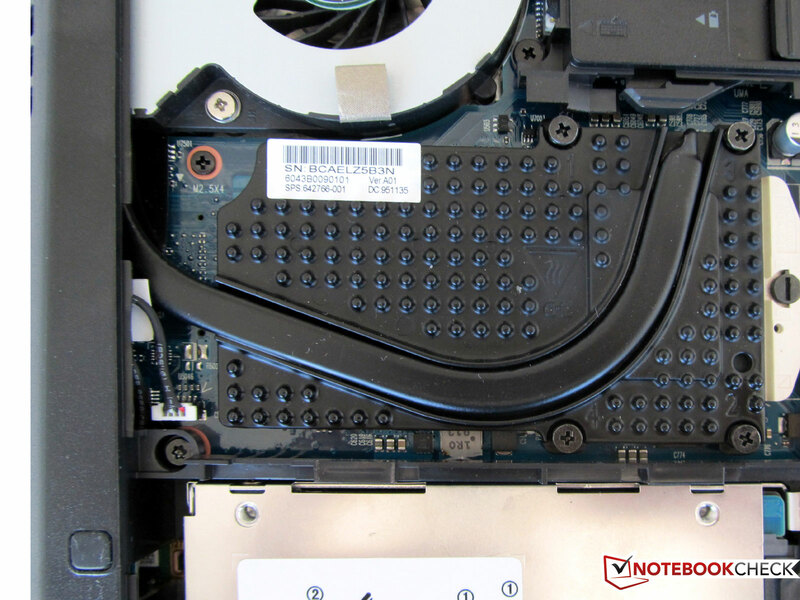 The HP ProBook 6460b LG645EA is even to survive attacks with liquids well. The keyboard is spill proof and, according to HP, even copes with a small rain shower. The brushed surface doesn't excuse any fingerprints, though. Every touch is visible even for hours afterwards. 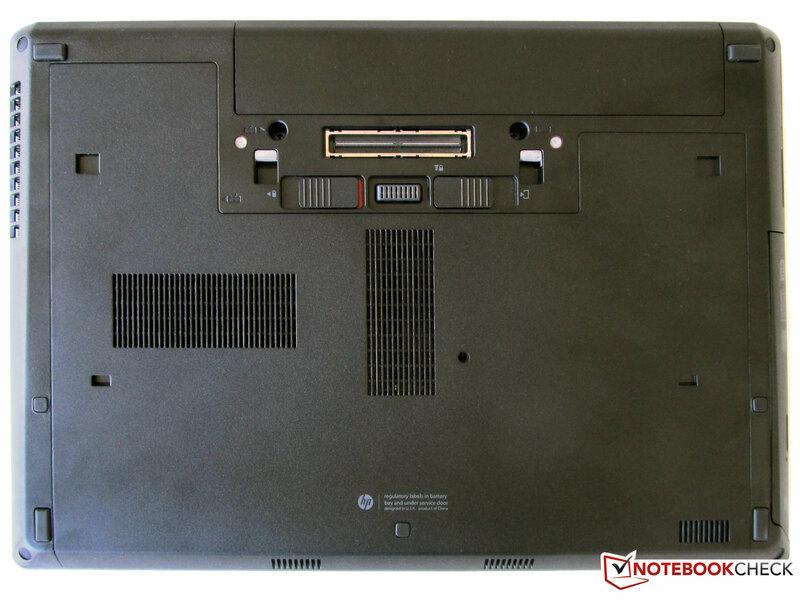 The HP ProBook 6460b LG645EA has a 14 inch HD+ screen with a resolution of 1600x900 pixels. The display needs a bit of getting used to in the beginning because script and icons are very small in this high resolution on the fairly small screen. In return, you receive the convenient advantage of having a relatively large desktop and being able to work adequately with even several windows at the same time. The screen display bids an acceptable picture in an ideal viewing angle, but it deteriorates quickly when the viewing angle is not ideal anymore. Colors and contrast also lose their quality quickly outdoors and in direct sunlight. There's nothing to complain about in terms of installed hardware. The built-in dual core CPU from Intel (i5 2520M), together with the incorporated HD Graphics 3000, the 4 GB of RAM and a fast 7200 rpm hard disk bids a solid application performance for virtually all office situations. 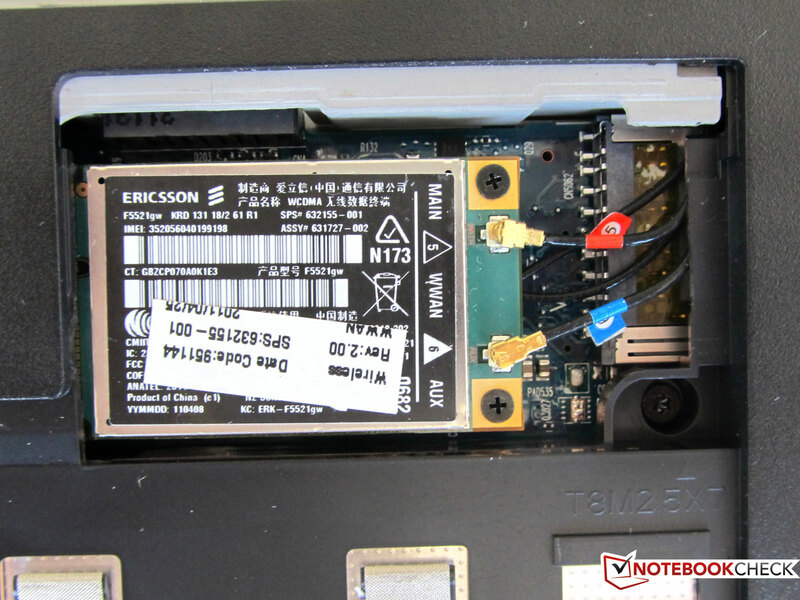 The HP ProBook also has a lot to offer in regard to connectivity: Besides Gigabit LAN, WLAN (802.11 b/g/n), and Bluetooth 2.1, a 56k modem and a HSPA+ module (WWAN) are also installed. The battery life isn't so impressive for a 6 cell lithium ion battery. The battery runtime sinks to 3 hours and 35 minutes in practical use with enabled WLAN. Overall, the HP ProBook presents itself as an elegant workhorse that not only leaves a good impression at the office and during field work, but also manages its tasks more than satisfactorily. HP ProBook 6460b LG645EA with a 14 inch HD+ screen. The DVD drive is installed on the HP notebook's left. WWAN module for 3G connections. Heatpipe: no shiny copper this time. The 2nd RAM slot is still empty. 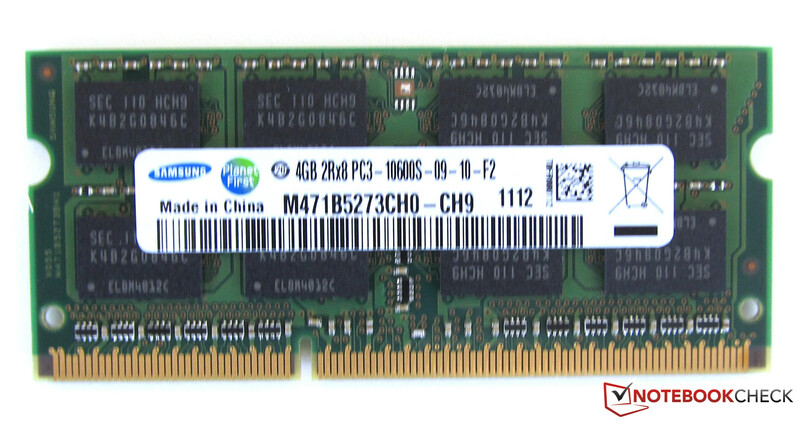 The 4 GB memory module. Power off for the touchpad. Connections for a 56k modem and a VGA monitor. Audio sockets for headphone and microphone. FireWire and 2 USB ports are located on the case's left. 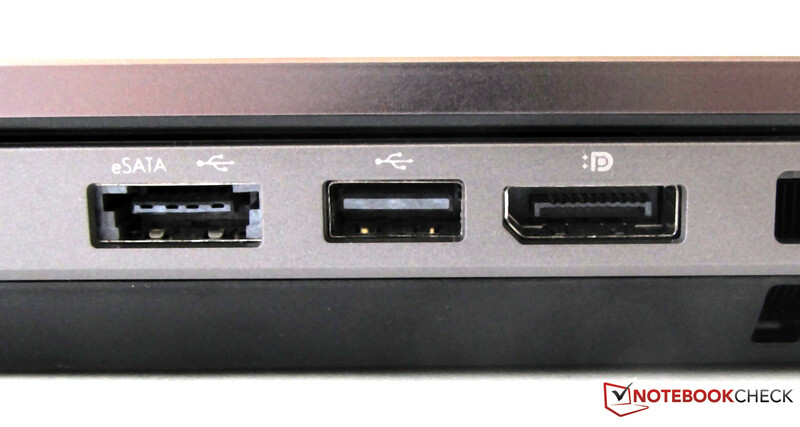 Almost always present: eSATA/USB combo, USB 2.0 and display port socket. 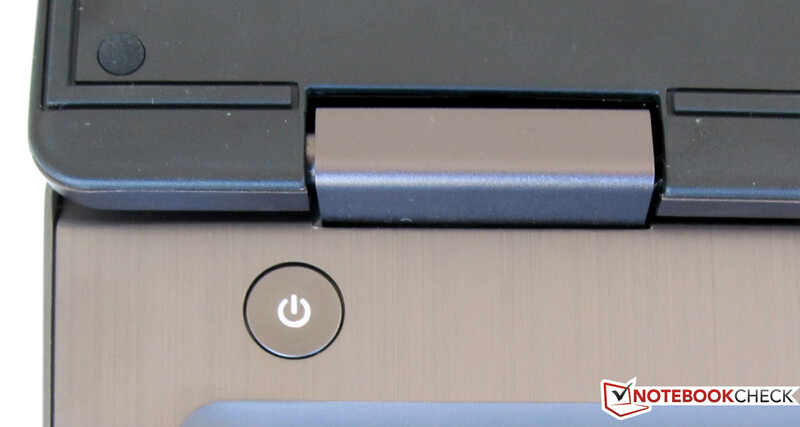 One of many security features of the HP ProBook: the fingerprint reader. The case lid is anchored securely in a closed state. Another security feature: the Kensington lock slot. Several LEDs light up on the case's front. The display lid is held by two stable hinges. Alike the other HP devices of this range (ProBook 6560b), we like the ProBook 6460b LG645EA's workmanship, the material, and the stability. Regrettably, it wasn't enough for a really good screen in the portable ProBook 6460b.